We’ll be playing at Wentzville’s newest country bar, Palomino Nites on Saturday, June 6th. We hear it’s a hoot and we highly recommend that you pay ’em a visit when you’re out that way. Here’s the address: 1799 Mall Pkwy, Wentzville, Missouri 63385. An simple, honest country woman. Having a party? Hire us! If you’re planning a party, bbq, pig roast, wedding, Bar Mitzvah or any such occasion, Trigger 5 is your band. We could play up to 4 hours and provide just the right vintage country touch to liven things up. The Grove is just a flat out cool neighborhood. With the Atomic Cowboy leading the pack of great restaurants/clubs, the Grove is also a great place to hear live music. We’ll be at the “Baja Mexican Nuclear Night Spot” from 6PM ’til 10PM this Friday, May 8. Gather up a group and come see us for happy hour and beyond. 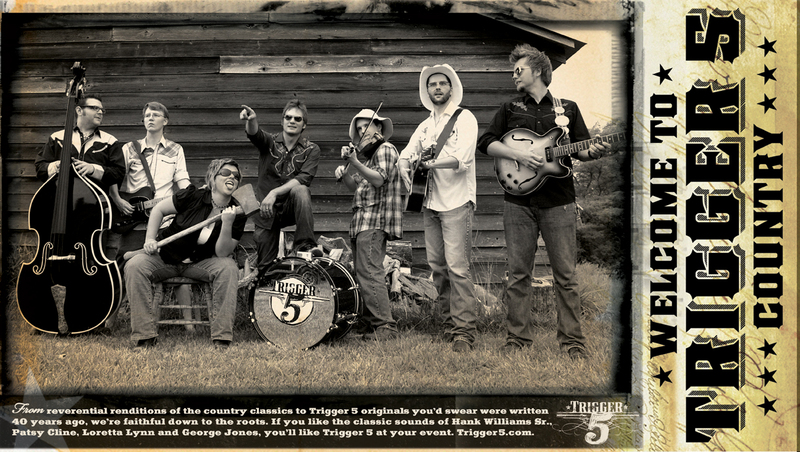 If you haven’t been to a Trigger 5 show lately, you need to check this show out. We’re on fire!